Apologies for my terrible, terrible slackness. It is all too familiar excuse – work, work and more work. In between my long hours chained to the desk, I did however manage to sneak in a few Melbourne Food & Wine Festival Events (and master the Secrets of the Red Lantern goat curry – but more on that another time). My absolute favourite event of the Festival was not an expensive, fancy dinner prepared by a celebrity chef, but rather the very informative and reasonably-priced ‘Moonlight Shines’ Oyster Class run by Cumulus Inc.
Cumulus Inc. will again host Steve Feletti, the man behind the nation’s most innovative range of oysters, from the Moonlight Flat Oysterage in Batemans Bay. Join him in Arc One Gallery, next door to Cumulus Inc, where you will be guided in an oyster tasting, receive a lesson in the art of oyster shucking and enjoy a range of refreshing beverages to match. A great range of drinks designed to match the oysters, which included some surprising options – Champagne, a dry Spanish Sherry, Coopers Stout, a German Riesling and a French Chablis (produced from chardonnay grapes). We also got a hot tip that Cricketers Arms beer works really well with oysters. 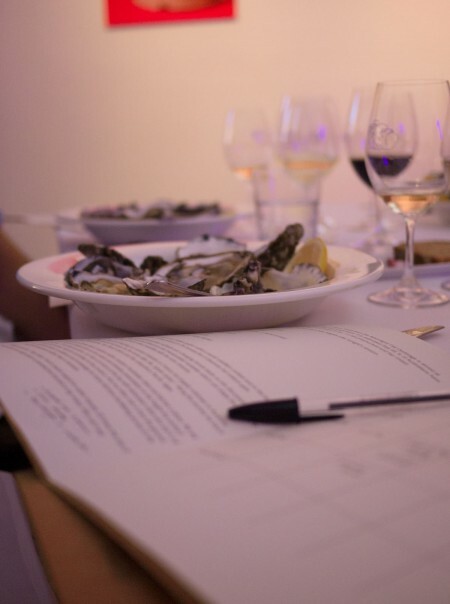 We were supplied with a comprehensive Tasting Notes Sheet and when tasting the oysters were asked to consider the variety of oyster, its aroma, colour and texture, as well its influence (botany, geology and hydrology) before giving it a personal score out of 10. To be honest, it was all a bit overwhelming (evidenced by the fact that under the ‘armoa’ column on my tasting notes sheet I wrote “taste of the sea” or “salty” for over half of my entries)! 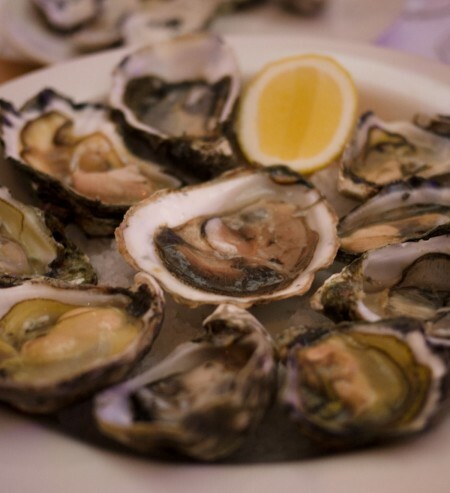 Oysters, like grass fed wyagu beef, requires ‘finishing’ to ensure that the end product is of premium quality and bears a unique or ‘signature’ flavour which indicates its provenance. The French have mastered the art of finishing - affinage - right down to being able to produce unique green oysters. Believe it or not, it took an hour long Powerpoint presentation to learn all of this information, and while it was certainly interesting, we were unfortunately still had not sampled our first oyster of the night! 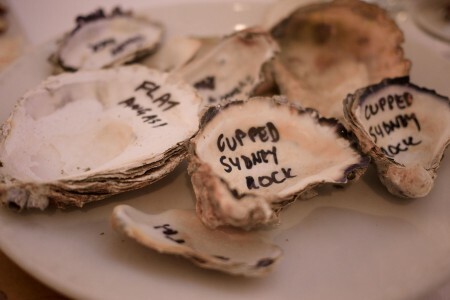 Tasting notes..."taste of the sea"
It was wonderful to have the opportunity to taste so many different varieties of oysters on the night – including some I had never even heard of like the Bruney Island, the Rusty Wire and Wallis Lake. I personally did not really like the Wallis Lake (4/10), but the Rusty Wire was a surprising standout of the night (8/10). My personal favourite oysters of the night were the Petit Clair (9/10) and the Clair de Lune (8.5/10). Both of these oysters were Sydney Rock Oysters – they were both small and delicate, with a lovely sweet, creamy (almost buttery) texture. The Petit Clair just edged out top spot as it left a lingering, luxurious feel on the mouth. After devouring all 10 oysters, everyone was given the opportunity to learn how to fresh shuck their own oysters, under the supervision of a number of the chefs from Cumulus Inc. (who told me that they shuck on average 300-400 oysters per night at the restaurant! ), including the head honcho, Andrew McConnell. Learning how to shuck an oyster courtesy of the chefs at Cumulus Inc.
Buy a specialist oyster knife. You can buy them for about $20 at homewares stores. Do not imitate The Doctor and use a screwdriver. Fold up a tea towel into thirds lengthways, place the oyster in the middle and fold to cover the shell and make a ‘nest’ that will protect your hands. Have the oyster ‘beak’ sticking out – facing towards you. With the tip of the knife flick the first couple of millimeters of the ‘false beak’ up and off, revealing the true hinge point between top and bottom lids. Gently but firmly wiggle the bent point of the tip of the blade into the visible hinge line. You will feel the lid ‘pop’. 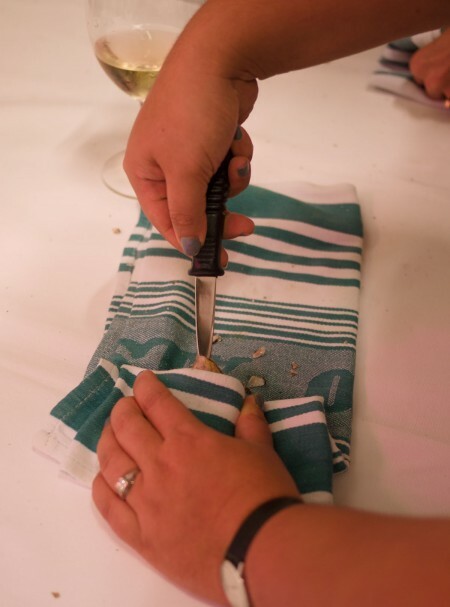 Gently slide the blade of the knife horizontally around to the other end of the oyster severing the thick muscle which holds the upper and lower shell together. If you accidentally break some chips of shell into the oyster, gently brush them away with a clean pastry brush. 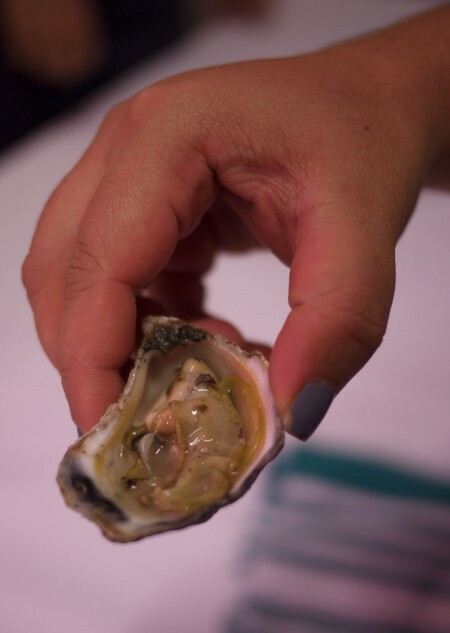 Until you have tasted a fresh shucked oyster, full of its natural ‘taste of the sea’ juices; it is difficult to comprehend the enormous difference in flavour when compared to a pre-shucked oyster which has typically been dried out in the fridge, or tap rinsed. However, don’t take my word for it – try a shucking an oyster yourself at home!